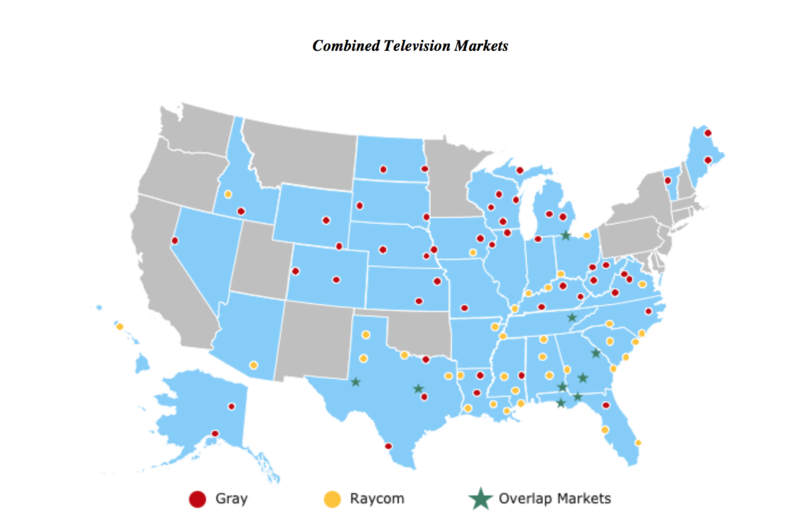 TV station owner Gray Television Inc. has set a $3.6 billion deal to buy Montgomery, Ala.-based Raycom Media Inc. — a merger that would create the third-largest television broadcast group in the country behind Sinclair and Nexstar. The deal announced Monday marks Gray’s transformation from a small, regional broadcaster into a leading media company with nationwide scale based on high-quality stations with exceptional talent in 92 markets. According to a statement, the companies say the combined company will have more than 140 television stations. Howell will become executive chairman and co-chief executive officer after the deal closes. Meanwhile Raycom President and CEO Pat LaPlatney will become Gray’s president and co-chief executive officer. The transaction is expected to close in the fourth quarter of 2018, pending customary closing conditions and regulatory approvals. Daniel Sutter: A merger for a stronger future?